It’s the 25th week of the year and the Sun is in Cancer. The card of the week is Justice and the number of the week is 7, a number that brings acquisition of knowledge through personal reflection. 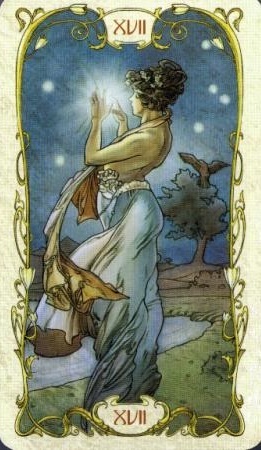 The Justice card fits well with this because it signifies a search for truth for those who seek it. Most likely, the truths you seek will be emotional ones this week with the Sun in Cancer. Compared to previous weeks, there are less aspects that we will be working through so it’s the perfect time for reflecting on how you got to where you are now. Realize that everything that has manifested in your life is a direct response to your actions. 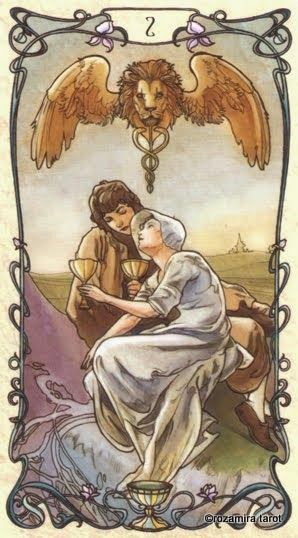 The card of the day is the 2 of Cups, a card of partnerships and connections. The Moon is also in Scorpio so it will intensify emotions surrounding your relationship with your partner, family or friends. The Moon makes a square with Venus, at 3:44 AM EST, bringing difficultly expressing emotions along with it to the ones you love. This is amplified by the Moon in Scorpio. The Moon alo squares Jupiter at 6:41 AM EST so be careful about binge spending. The Moon is conjunct Saturn so you may accept that you have all these uncomfortable feelings about relationship that you need to deal with but that doesn’t mean they won’t bother you. But the good news is that 6, the number of the day that represents harmony, encourages that if you approach your loved ones with openness and honesty, you will be able to strengthen your partnerships and discover the wonderful things the people dear to you have to offer. Mantra: I commit to work through problems with my loved ones. 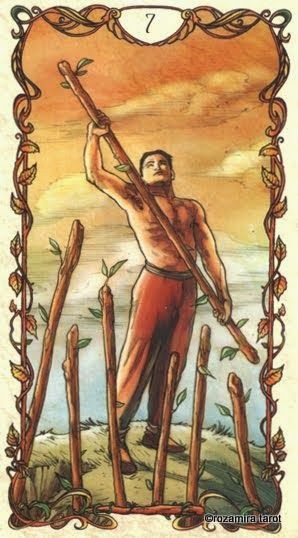 The card of the day is the Two of Swords, suggesting that your thinking is out of balance and preventing you from seeing what you need to know. The Moon forms an opposite with Mercury, so you may feel restless and excitable. 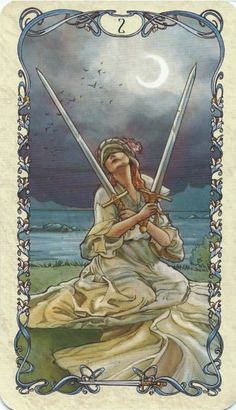 That energy will fuel you to have the breakthroughs that are possible when the Moon makes a trine with Uranus and you will be given the chance to remove the blindfold pictured in the 2 of swords. The Moon will make a trine with Venus at 1:47 PM EST, bringing a more mellow disposition along with it. By the time the Moon makes a trine with Jupiter at 2:18 PM EST, you’ll be feeling happy and secure, especially at home. The numerology of the day is 8, a number of accomplishment. Mantra: You reap what you sew. The card of the day is the High Priestess encouraging you to look deep within for the answers you seek. She reminds us that the power we seek is always within us. We just need to change our perspective to find it. It’s the Full Moon as well so use the power you know you have to focus on what you want to obtain and project it outward today. Venus will conjunct Jupiter at 3:51 AM, bringing abundance, happiness and love at extraordinary levels. Things will fall together in your love and work life that you have been striving for and peace will bless the day. This is one of the best aspects of the later half of 2015 and be prepared to take advantage of it. 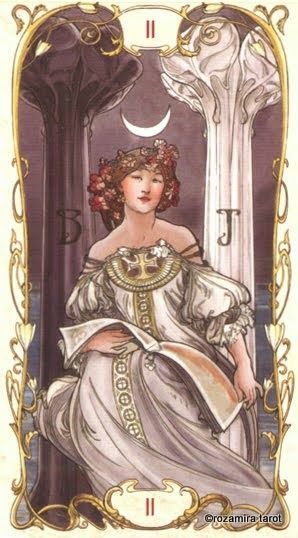 Tap into the energy of the High Priestess, who is also ruled by the Moon, and do what you know you must do to use this energy in your favor. It’s full Moon and the perfect time to take what is yours! The High Priestess is all about intuition, and you’ll be feeling it when the Moon makes a sextile with Neptune. The Sun trine Jupiter brings the creativity and imagination you need to create your destiny. With all the craziness in the air, you may feel a little confused from the energy of the Moon opposite Sun, but that’s to be expected when there is so much potential buzzing all around you. All of this happens when the Moon is full in Capricorn, giving you the drive reach those goals you set. The number of the week, 7, appears again, reminding us that everything is coming together and that we will attain our desires. Mantra: I’m ready for all the love, success and victory the Universe has to offer me! Today is the day to build on what took off with a bang the day before. Everything you put your energy into is in place and the Star reassures you that your actions are blessed and you will reap the benefits if you haven’t already. You shine like the stars and everyone will notice. The Moon is still in Capricorn so you want to keep up the hard work and continue to make solid plans and forge ahead. The Moon conjuncts Pluto and you feel yourself pulled in a new direction. Follow it. Mercury sextile Uranus gives you the edge you need to do something revolutionary. The Moon also makes a square with Uranus, bringing intensity but with the Moon in Capricorn, you can handle it. The number of the day is 8, a number of taking action. You’ve got this. The past couple of days were filled with excitement and potential. 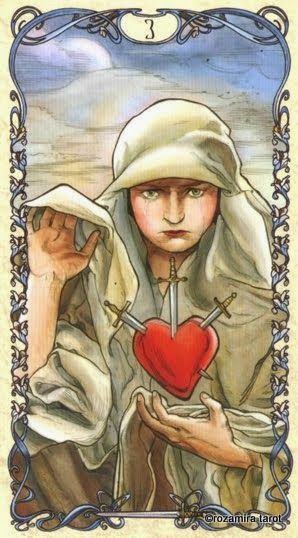 That energy is still in the air, so don’t let disappointments that may come with the Three of Swords get the best of you. The Moon sextile Saturn may leave you feeling that your goals are unattainable. But remember, most aspects with Saturn teach us the wisdom that comes with perseverance and approach everything like you’re running a marathon, not a sprint. Mercury sextile Jupiter will give you a boost of positive thinking to push through any blocks in your way. The Moon enters Aquarius at 8:21 AM EST so focus on what sets you free and go for it. The number of the day is 9 reminding you that you’re closer than you think to completion. 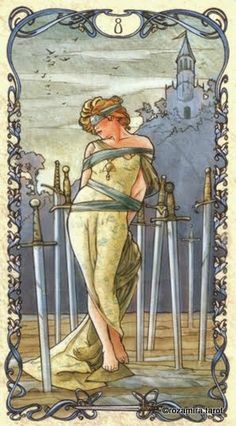 The card of the day is the 8 of Swords and that makes perfect sense with the aspects abound. The Moon sextile Uranus will encourage you to act spontaneously and explore new things. This is amplified by the Moon in Aquarius. But the Moon opposite Jupiter reminds you to not be too flashy or outgoing. A balance is needed or you’re going to feel trapped and boxed in. The number of the day is 1(0), so whatever is begun today needs to be done so with care to maintain the balance between knowing when to go for it and knowing when to have restraint. Mantra: By finding a balance between spontaneity and self control, I set myself free. This entry was posted in Astrology, mysticism, numerology, occult, self help, spirituality, Tarot, witchy, Writing and tagged astrology, numerology, occult, self empowerment, self help, spirituality, tarot, witchy. Bookmark the permalink.